Iraqi civil engineers familiar with the Mosul dam are warning of the dam’s imminent collapse, saying that the consequent death toll would likely be worse than earlier estimated. The engineers warned that the loss of life from a sudden collapse of the Mosul dam could be higher than earlier official estimates of 500,000, as many people could perish in the resulting mass panic. If the dam collapses, a 20-metre-high flood wave would hit the city of Mosul, then roll on down the Tigris valley through Tikrit and Samarra all the way to Baghdad. Iraqi civil engineers familiar with the Mosul dam are warning of the dam’s imminent collapse, saying that the consequent death toll would likely be worse than earlier estimated. The engineers noted that rapidly building pressure on the dam’s compromised structure. The pressure is the result of melting winter snows and more flowing into the reservoir, filling it to capacity. At the same time, sluice gates used to relieve that pressure were jammed shut. The New York Times reports that the Iraqi engineers also said the failure to replace machinery or assemble a full and trained workforce more than a year after ISIS temporarily gained control of the dam, means that the chasms in the porous rock under the dam were getting bigger and more dangerous every day. A contract with an Italian engineering company to repair the dam has not yet been signed. The engineers warned that the loss of life from a sudden collapse of the Mosul dam could be higher than earlier official estimates of 500,000, as many people could perish in the resulting mass panic. If the dam collapses, a 20-metre-high flood wave would hit the city of Mosul, then roll on down the Tigris valley through Tikrit and Samarra all the way to Baghdad. The Mosul dam has suffered from problematic geology from 1984, when it was built. The main problem is that the bedrock on which it is built is water-soluble. Water began seeping through in 1986, and it became apparent that the geological problems were worse than initially thought. During the past three decades, the dam required constant maintenance to fill the holes created by water running through the soluble bedrock. 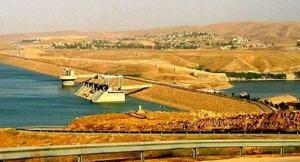 During the past year and a half, since ISIS had taken control of the dam and its subsequent capture by Iraqi forces, no maintenance work on the dam and its foundations has been performed.